Improving data backup and recovery continues to be a top priority among senior IT decision makers, as highlighted in a 2015 IT Spending Intentions survey conducted by ESG. Organizations plan to invest in modernizing data protection, including the cloud. 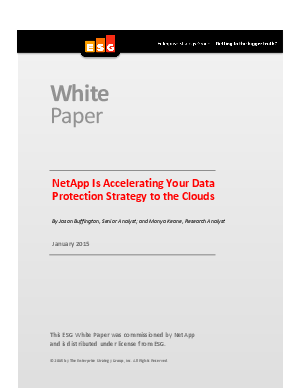 Learn the key considerations when evaluating a cloud-extended data protection solution that provides security, efficiency, effectiveness, and risk mitigation.